– Here we review some of the best free cloud storage solution providers that include Google Docs, Windows Live Sky drive, Box.net, Dropbox and ADrive to store, access, manage, view and edit files of all types. Online storage is just one aspect of cloud computing and it is one popular method to share files these days! They not only help in sharing files but also serve as good back up solutions for all your files, including photos and videos. 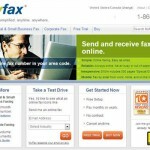 There are now several cloud storage solution providers online and the best among them offer both free and paid plans. Here we list a few good online storage providers and their features. We primarily review their free plans in detail, though we did our best to provide a brief outline of their premium plans and features as well. This online storage solution provider offers personal, business and enterprise types of plans. While the personal plan is free and is intended for individual users, business plans are available at as low as 15 dollars per month. In addition, there are also custom enterprise plans and the pricing depends upon the enterprise needs. The personal (free) online storage plan provides you with free web storage of 5GB. If you do like to store more files under the personal plan, you can do so for a nominal fee, Currently it is 9.99 dollar for 25 GB and 19.99 dollars for 50 GB.The maximum file size that you can upload under the free option is 25 MB, while the paying users can upload files of size up to 1GB in size. Business plan users get 500 GB of cloud storage space and they can upload files up to 2GB in size. While personal plan holders can not only share their files using their file sharing links but they can also access their online storage from their mobile phones (using free mobile apps). Business plan users can additionally enjoy password protected file sharing and faster uploads. Box.net promises to be a good alternative to microsoft exchange and SharePoint server, when combined with Google apps. It integrates with the following third part service providers. Dropbox is another good online storage service provider, offering free online storage of up to 2GB. If you do require any additional storage, you can avail up to 100 GB for a fee. What is cool about Dropbox is you can sync files between online storage and any or all your computers running either windows, mac or Linux! The sync is automatic and Dropbox does it as soon as it detects new files or changes. The syncing can be done through a Dropbox tool, which you can download and install on your computer for free. You not only get web access but also mobile access to your files stored in their cloud. Mobile access is available through free applications for Android, Blackberry, iPhone, and Ipad. 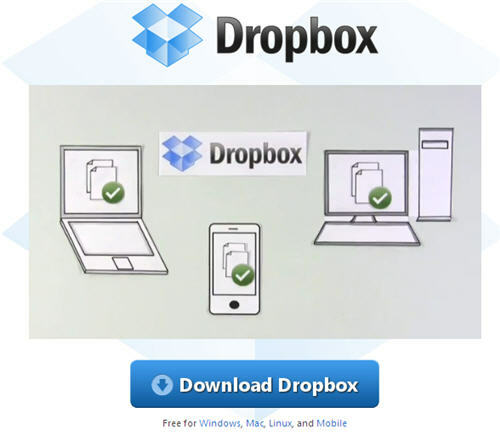 Dropbox lets you share files on the web using their file sharing links, provided you give public access to those files. In addition, you can share folders in the Dropbox cloud with only people that you choose. You also have complete control over the shared folders, as you can not only remove any misbehaving user, any time, but also delete files downloaded to their computers. However, you will do well to remember that if they back up the files elsewhere, you may not be able to delete those back ups. And if you are an enthusiastic photographer who shoots and shares a lot of photos, you are going to love Dropbox, since you can automatically create shareable online photo galleries out of regular folders. Dropbox is free up to 2B and further storage space is available at 9.99$ per month for up to 50 GB and 19.99$ for up to 100 GB of online storage space. There isn’t any limit on the file size that you can upload, but free users will obviously be limited by the storage space of 2GB. 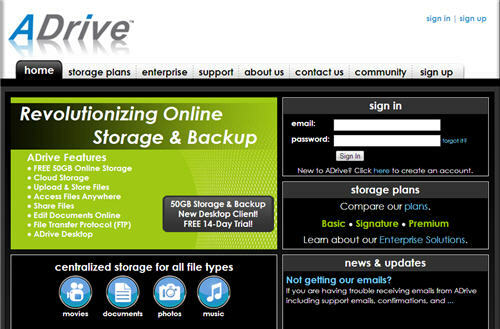 ADrive provides up to 50 GB of free online storage and if you are a premium user, you also get a desktop client to access your files. The desktop client is however not available for free users. However, they can enjoy premium features as part of a 14-day trial pack. Premium users not only get the desktop client but also more storage space. They can also access the cloud through SSL. ADrive also provides a WebDAV, with which you can conveniently map your ADrive account, directly to your computer. You can use it without the need to sign in to their web interface to manage, upload, or download your files. Any files you manage using WebDAV will also be accessible when using their web interface. What we liked the best about ADrive is their file history. As part of the history they store all versions of the files.Thus, even if you accidentally overwrite a file, you can retrieve any of its earlier versions. 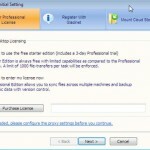 This feature is available for premium and signature plans and free users need to pay for recovering files from history. Note that this feature is also available on box.net. Like other services, you can share files through a unique link, provided the files have public access. ADrive also integrates with Zoho document editor to let users edit their documents and excel files online. ADrive have also promised more features like a media player, image gallery and folder sharing. Note that these features are already available on Dropbox and box.net. 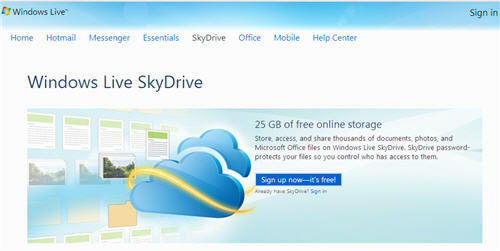 Microsoft’s Windows Sky Drive, that hosts Microsoft Office Online, provides its users up to 25 GB of free cloud storage. This includes the 5 GB of free storage space that you get with Windows Live Mesh. This 5 GB is available for you to sync folders on your computer, even if they have files that are larger than 50 MB. But you can just back up your files here and you cannot view or edit Office documents stored in this space, unlike the rest of the storage space that you get with sky drive. Windows Live Mesh can be downloaded and installed as part of Microsoft’s windows live essentials free download. Skydrive lets you upload and share documents, photos and videos and you also get password-protected access to your files from virtually anywhere. Sharing is easy and you have complete control over who has access to your documents, photos, and Office files. There aren’t any paid plans here and there is also no desktop utility (other than the Live Mesh) to sync your files.But do remember that you can sync up to 5 GB of files using Mesh, which is much higher than what Box.net or Dropbox offers to free users. Like other services, you can share files through a unique link, provided the files have public access. Summary: Provides up to 25 GB of free space but is not feature rich like Box.net. If you are looking for large online storage, check out Sky Drive. You don’t have to sign up for a new account if you already have a windows live or Hotmail account. This service provides you with free online storage of up to 1 GB. Additional storage is available at affordable prices. You can upload documents, spreadsheets, presentations, photos and videos. However, for photos, you will do well to remember that you get an additional 1 GB through Picasa which also has some simple but brilliant photo editing features. Likewise, for videos, Youtube provides you with unlimited storage space and it is one popular way to share videos either publicly or privately. Youtube also provides a basic video editor and it makes it easy to share your videos. Coming back to Google Docs, it lets you view and edit your documents, spreadsheets and presentations from your computer or mobile phone. However, you need to manually upload the files, after signing in to your Google account and there is no desktop sync utility. Summary: The service provides only 1GB of free space, but it is primarily for docs and you also have Picasa for photos and Youtube for videos. A sync utility will make it a decent online storage service provider, though additional features like in box.net, will be great to have. Check out Google Docs. You don’t have to sign up for a new account if you already have a Google account. Most of the above online storage services provide real time collaboration with several useful features and a decent storage capacity. You can choose either one or more of them depending on your needs. Enjoy the free online cloud storage. Find out how to manage all your free online storage with Gladinet. You should mention that Google offers additional online storage (above and beyond the initial 1GB) for VERY reasonable prices. Check out https://www.google.com/accounts/purchasestorage for their rates – this should definitely be highlighted in your review! I really appreciate this article, it was really great to have all this info in one place. Thanks! DropBox and SugarSync are the best cloud storage companies. Their systems are reliable, but easy to use. Nice review, very useful. One question though, i don’t really like the Gladinet interface. feels too complicated. do you have a suggestion for something more simple? Try using CloudKafe. much user friendly interface.